President Muhammadu Buhari has announced the first set of appointments into his administration. 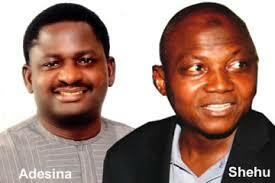 The President on Sunday evening, May 31, 2015 named Mr Femi Adesina and Garba Shehu as his spokesmen. Femi Adesina will serve as Special Adviser (Media and Publicity) while Garba Shehu will be the new Senior Special Assistant (Media and Publicity). The President has also approved the appointment of Lawal Abdullahi Kazaure as the State Chief of Protocol (SCOP). Mr Adesina is the current President of the Nigerian Guild of Editors (NGE) and serves as the Managing Director/Editor-in-Chief of The Sun newspapers. Garba Shehu served as the Director, Media and Publicity of the APC Presidential Campaign Council. He was the President of the Nigerian Guild of Editors sixteen years ago. Abdullahi Kazaure is a career Foreign Service official and currently serves in Aso Rock Villa as a Special Assistant (Presidential Matters).